Boots No7 Fanomenal Lash Serum Review | Does Boots No7 Work? There are several different eyelash enhancing serums out there which promise to improve upon the length, thickness, and overall health of your lashes. Finding a high quality product at an affordable price, however, is difficult. Below, we'll give a thorough review of one of the more easily accessible over-the-counter products, Boots No7 Fanomenal Lash Serum. For more information on what this eyelash enhancer can do for you, just keep reading! As stated above, the No7 Fanomenal Lash Serum is an eyelash growth enhancing gel designed to give you thicker, longer, fuller, sexier eyelashes after just 8 weeks of use. 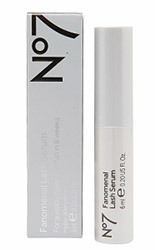 The No7 lash serum is sold by Boots, a health & beauty manufacturer based out of the United Kingdom. The company is big on corporate social responsibility, as well as providing customer satisfaction for all of the products they sell. Unlike most of their competitors, there seem to be more favorable reviews for No7 Fanomenal Lash Serum than unfavorable ones. However, even those satisfied customers who gave the serum 3 or more stars had a few critical points to address. For one, it appears as though No7 Fanomenal Lash Serum suffers from a "diminishing returns" problem; the shorter, thinner, and sparser your eyelashes are when you start using the product, the more significant your results will likely be. So if you have a serious problem with short, thin, and virtually non-existent eyelashes (or eyebrows - like many lash serums, it is designed to work on eyebrows too), the happier you will be after 8 weeks. However, if you already have average lashes, or slightly longer/thicker/fuller-than-average lashes, your results will most likely range from minimal to non-existent - according to currently published customer reviews, that is. Another complaint that users had was with the brush applicator. Most eyelash serums are designed to be applied in the same way that you would a liquid eyeliner. This is true for No7 Fanomenal Lash Serum also; however, the applicator brush is extremely thick and large, which makes application difficult for many customers. You have to do a little digging to find No7 Fanomenal Lash Serum's ingredients, because they aren't published on the manufacturer's website. They also don't go into detail about which ingredients are behind the magic of No7 Fanomenal Lash Serum, although it does have some seemingly beneficial peptides and hydrolyzed keratin. It also has an abundance of parabens, as well as a noticeable lack of botanical extracts. Some users did report a burning/stinging sensation with use, but most of this was attributed to accidentally getting the product into their eyes because of the clumsy, oversized applicator. The unpleasant side effects seem to be much less prominent than they are for most competing products. Before you rush out to buy your own tube of No7 Fanomenal Lash Serum, keep in mind that it isn't the only peptide-rich eyelash growth serum on the market. 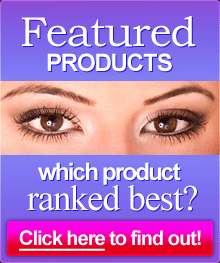 To see how No7 Fanomenal Lash Serum compares to its toughest competitors, take a look at our product comparison page!